IBOA the Finance Union is the leading trade union representing staff in Ireland's financial services sector – with almost 22,000 members located in the Republic of Ireland, Northern Ireland and Great Britain. The IBOA Executive Committee has decided that this year the Union's annual charitable donations will support charities working on the issues of suicide and self-harm. 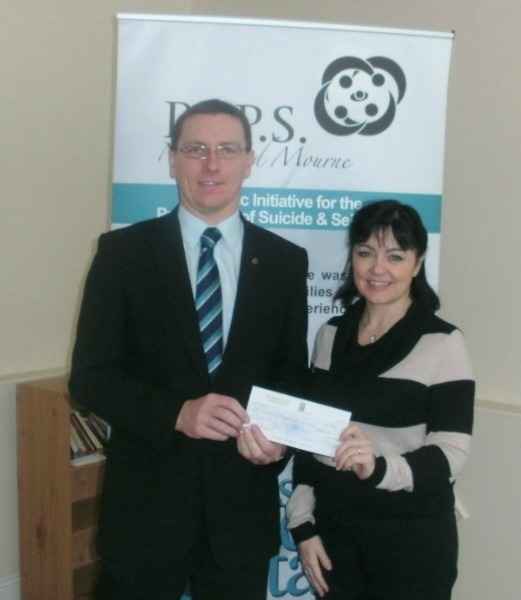 In the Republic, the Union has donated E5,000 to Pieta House, a nonprofit organisation providing a specialised treatment programme for people who have suicidal thoughts or who participate in self-harming behaviours. PIPS Newry and Mourne graciously thank IBOA for their generous donation of £2500. Pictured are Dympna Maguire PIPS Newry and Mourne and John Burns, Ulster Bank Group Officer, and Executive Committee Member, IBOA The Finance Union.